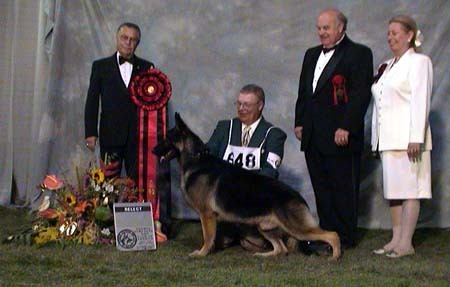 "He is a medium-sized dog, well pigmented with marvelous timing and a beautiful front reach with a strong, smooth underdrive. He carries a perfectly level back at all speeds, is animated and has a beautiful head with dark eyes and an excellent ear set. His temperament cannot be faulted, in any manner, and over-all was the best class animal of the day."